Logo of the Mexico City Jaguars. The Mexico City Jaguars (Sp. Jaguares de Ciudad de México) are a Major League Bloodbath team based in Mexico City. They play in the “Muertos” Southern Division of the New World League. The Mexico City Jaguars originated as the Tenochitlan Jaguars, one of the founding franchises of the MLB. Continuously active since 1492, the Jaguars, along with the Istanbul Ottomans, are one of the oldest teams in professional bloodbath. 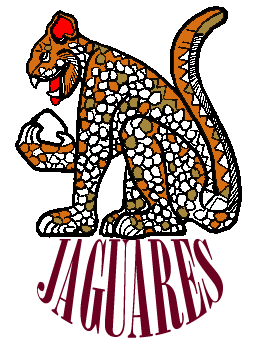 In 1521, the team was reorganized and renamed the Mexico City Jaguars. The present logo of the Mexico City Jaguars Wild Ducks. Mexico's most outstanding team. The Mexico City Jaguars were at the height of their fame in the mid-nineteenth century, reaching the World Series several times. After a period of decline marked by infighting among the owners, the Jaguars finally slowly started to rise again in the late 1920s after a management shake up led by the PRI Group. Current rivals include the Guadalajara Maquiladoras and the Los Angeles Riot. 1519. Loss to the Cordóba Conquistadors. 1823. Victory over the Madrid Conquistadors. 1848. Loss to the Washington Generals. 1862. Victory over the Paris Égalité. Antonio López de Santa Anna, 1810–1855. This page was last edited on 21 October 2015, at 21:53.